Teachers, kids, and volunteers agree: Everybody Wins!, a nonprofit foundation, is a success. Adult reading mentors from organizations and corporations help disadvantaged elementary school children during lunch hour. The bottom line, according to a U.S. Department of Education study, is that children with reading mentors improve academically. Their classroom behavior improves too! Included: Learn more about Everybody Wins! In 1991, Arthur Tannebaum, distressed that minority children don't receive what he considers an equitable education, started the reading program. Children benefit from being read to -- that's not news. Not all parents have the time or the ability to read to their kids, though. That's why for the past nine years, Everybody Wins!, a nonprofit organization, has tried to fill the gap. Everybody Wins! 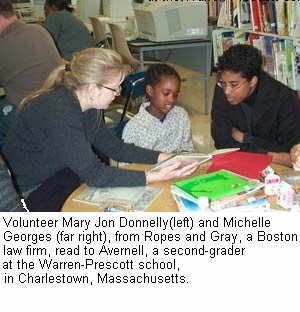 matches adult reading mentors from organizations and corporations with disadvantaged elementary school children. Teachers select students who read below grade level and would benefit from the attention of a caring adult. The volunteers promise to read to their reading buddies once a week during lunch hour. A volunteer also has the option to "share" a student with another volunteer: The two volunteers then take turns reading to the child, visiting the child twice a month instead of weekly. Children are not drilled in phonics or whole-word reading methods. The goal of the program is to leave kids with a love of books and learning. The bottom line, according to a study of Everybody Wins!, sponsored by the Planning and Evaluation Service of the Department of Education, is that when adult mentors read once a week with students who read below grade level, the students' academic performance and classroom behavior improve. The study evaluated poor readers in the Everybody Wins! Power Lunch program in Washington, D.C., and compared them to children not in the program. "This goes beyond just reading," said Janie Ortega, principal of Donald McKay School, in the east section of Boston, whose school participates in Everybody Wins! through Boston Partners in Education, another nonprofit organization. "The bond that forms [between the adults and children] is a true friendship." About 80 percent of the students who attend McKay School are Hispanic. Many are bilingual kids whose parents do not speak English, Ortega said. "The children very much look forward to being read to each week, and the volunteers feel a sense of needing to be here," Ortega told Education World. "What was wonderful to me was that bond that was formed last year between the volunteers and the children." At the end of the last school year, the firms that participated in the program invited the children to visit them for lunch. "I think the adults were having a more difficult time of letting them go at the end of the lunch hour because they knew they wouldn't be seeing [the kids] again for three months," Ortega said. "The children at that age [grade 1] don't really understand what it means not to see someone for three months. As we were leaving, I looked back and saw their expressions. They were really going to miss these kids. It was a moving moment for me." "As much as we do it for the students, we also get so much from it," said Angie Seldon, a Washington, D.C., human resources senior specialist for C-SPAN. "It shows me that even though I am just one person, I can mean something to someone else and pass on that love of reading." She has been meeting with her reading partner, Iesha, a student at the Walker-Jones School, in Washington, D.C., for the past six years. Seldon wanted to become a reading buddy to give something back to the community and to help a child. She believes that Iesha, who now is a better reader, can serve as a role model for younger children at her school and in her family. "Talking about this makes me smile," Seldon told Education World. "I'll be sad at the end of the year when Iesha goes on to middle school. Last year, at the end-of-school pizza lunch, students read letters to their mentors aloud. We all cried." A copy of Iesha's letter is displayed in Seldon's office. Another reading mentor, Pandit Wright, executive vice president of human resources and administration for Discovery Communication, Inc., apologized for "blubbering" about her Everybody Wins! experience. Wright has been meeting with Zoya, an elementary school student in Bethesda, Maryland, for the past four years. "There was no way you couldn't love her [Zoya] as soon as you met her," Wright said. "Right away I knew she was a very special, talented, outgoing, and smart child." It is tough to leave work when things are hectic, Wright acknowledges. She says, however, she gets a wonderful feeling just walking down the school hallway and that good feeling continues throughout the next hour when she and Zoya take turns reading aloud. Zoya's reading has improved and her relationship with Wright has grown. In a letter Zoya wrote to Wright, the child said: "Thank you for loving me. Thank you for reading to me." "It really is love," Wright said. "When I say love, it is a mutual thing." The success of Everybody Wins! is an example of how the private sector can make a difference for children, said Joanie Chase, executive director of Everybody Wins! Children learn by example from the busy adults who take time to read to them once a week, Chase told Education World. There are more than 400 reading mentors from Congress, including 20 senators and representatives, Chase said. "If they can read to a child, then we can all make the time." Among those congressional reading buddies is Sen. Edward M. Kennedy (D-MA), who has read with Jasmine, a student at Brent Elementary School, in Washington, D.C., for four-years. 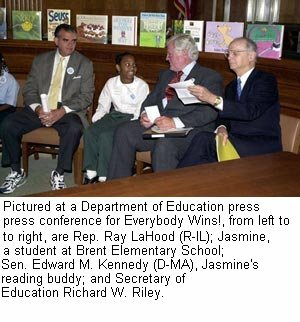 Jasmine attended a press conference with Kennedy and other dignitaries in September, when the Department of Education announced the results of its study of Everybody Wins! "Everybody Wins! is making a difference in many children's lives," Kennedy congratulated Everybody Wins! founder Arthur Tannebaum at the press conference. "And, as a volunteer, I know that these children in the program make a difference in my life too." Tannebaum, chief financial officer for a textile corporation in New York City, was distressed that disadvantaged children didn't get what he considered an equitable education. In 1991, Tannebaum took an early retirement and formed the privately funded, nonprofit Everybody Wins! "Thirty to 40 percent of our public school children don't have an equal opportunity to learn for lots of reasons," Tannebaum told Education World. "These kids aren't learning how to read and they don't stand a chance; their parents didn't stand a chance either." Tannebaum's wife, an elementary school teacher, suggested he develop a program that didn't pull children out of their classes but takes place during lunch and recess time. "I became aware of how important it was for children to have someone in their lives who read to them, someone they could talk to before they fell behind," Tannebaum said. In 1989, he and four other colleagues began to read to children at P.S. 116 during the lunch hour. Tannebaum estimates that during the past nine years, the foundation has helped match about 30,000 volunteers with about the same number of children. The program has expanded from New York City to Boston and Washington, D.C. Currently, he and Chase are developing a national strategy to further expand the program. "I started out because I wanted to do something for these children, and now it's on its way to becoming a very large, national program. We're helping a lot of kids in a very crucial way," Tannebaum told Education World. Mentors are very important because they can expand children's understanding and broaden their perspective, said Lester Laminack, head of the elementary and middle-grades education program at Western Carolina University, in Cullowhee, North Carolina. "This is increasingly true at a time when children are bombarded by video games, television, videos, and computer games. The need to fall into the world of words and create images for yourself is being replaced by ready-made images, even images the child can manipulate with a button."